Spring is coming! Must be time for the CU Russian Festival! 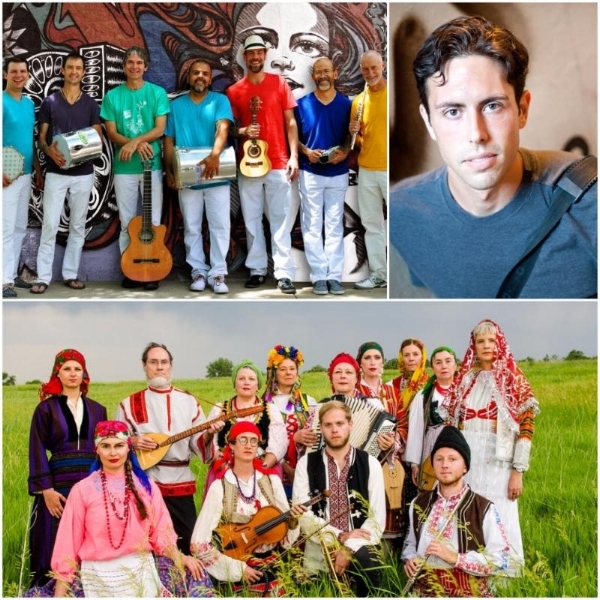 Join Planina for a celebration of the group’s 2018 cultural exploration in Bulgaria with an evening of new songs from the trip, favorites from the current repertoire, photographs, guest artists, and more. Members of Planina are among several groups performing very short sets as part of this community party being produced by Halina Palmer. The main event is YOU getting to participate in an open sing-along of holiday music. People of all ages and persuasions are welcome. There will be a Christmas tree and a Santa for photo ops, and hot spiced wine, cocoa and cider, and Old World cookies and treats coordinated by Halina (which means they will be delicious). You are encouraged to wear traditional costumes from any country, or holiday wear. Free and open to the public. The library is presenting us as part of their lunchtime concert series! We will sing several holiday songs from Eastern Europe along with love songs, dance tunes and more — featuring the unusual rhythms and soulful harmonies that make this music so compelling. The concert is free and open to the public. No tickets are required. The first 90 minutes of parking at the library are free; read about that here. And here’s the info about the concert. Tickets are now available for this concert, in which Planina will bring the richness of Eastern European vocal music to a concert shared with our friends and musical colleagues Marrakech Express. Marrakech Express takes you on a sonic journey to a place where the microtonal beauty of classical Arabic music, the traditions of Andalusian and rumba flamenco music from Spain, the rhythmic influence of the Mid-East and Africa, the soulful desert sounds of the G'nawi people, and the urban grooves of Moroccan sha'abi and edgy Algerian rai music all blend together to make North Africa a crossroads of beautiful, exotic, and ever evolving sounds. This concert is being presented by First Universalist Church of Denver and will take place in their beautiful new sanctuary, with its lovely lighting and acoustics. Hope to see you there! Get your tickets here. All are welcome! This free event hosted by the parents and teachers at Bear Creek Elementary School includes cultural facts, crafts, alphabets, coins and history from various countries, plus face painting and games. Food trucks will be on hand offering international cuisine for purchase. Other performers are Hora Romaneasca, Danza Azteca Huitzilopochtli, and live Scandinavian music by People with Instruments. This annual festival on the lawn at CU-Boulder has become one of our favorite signs of spring. It takes place on the northwest corner of the University of Colorado-Boulder campus, on the lawn between Hale Science Building and Varsity Pond near Broadway and University. It starts around 4:00 p.m. and Planina sings two 20-minute sets between 4:30 and 5:30 p.m.
Planina is excited to be invited back to Swallow Hill to share the stage with our friends Marrakech Express. Specialists in North African music, Marrakech Express interweaves the microtonal beauty of classical Arabic music with the fiery traditions of Spanish flamenco and rhumba guitar, the rhythmic influence of West Africa, and the soulful desert sounds of the Gnawa music of the Berber tribes. Members are: Samir El Yesfi, Brett Bowen, Dexter Payne and Sandra Wong. Skyline Park at 16th St. Mall and Arapahoe St. 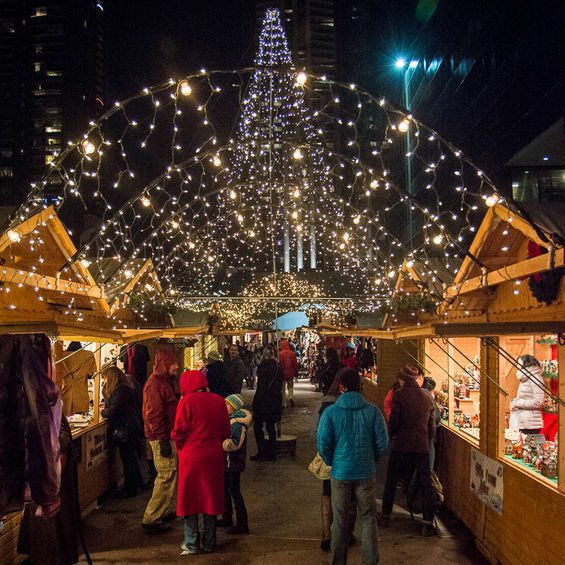 The Christkindl Market is a downtown Denver holiday festival reminiscent of a German Christmas market. It takes place over many weekends and evenings between late November and Dec. 23, with various food and beverage vendors, craft vendors, and different performers on different days. The setting is a covered and heated tent, and there are tables and chairs for audience seating. On Sat., Dec. 9, join Planina for music from Eastern Europe, including a Winter Solstice song from Latvia; Christmas songs from Belarus, Bulgaria, Hungary and Ukraine; and other rousing and inspiring music. The Dairy's World Beat concerts in the Soundscape series feature music from three different countries. For this concert, musicians presenting music Brazil, Sweden and the Balkans will be represented on stage performing one after the other in a round-robin fashion. Dazzling audiences with the captivating rhythms and energy of traditional Brazilian music for over a decade, Boulder based Brazilian band GINGA is known for bringing audiences to a quiet purr with a sultry Bossa Nova, or blow the roof off the evening with a full blown Carnaval-style samba dance party. Scandinavian folk musician and Assistant Professor of Ethnomusicology at CU Boulder, BENJAMIN TEITELBAUM, specializes in Swedish folk music and Sweden’s unofficial national instrument, the Nykelharpa, and tours nationally and internationally as a performer and teacher. PLANINA is the third group, known for our renditions of haunting and beautiful songs from Eastern Europe and the Balkans, performed in authentic costumes, and singing in the original languages with regional vocal styling. This concert will be an exciting and cultural musical conversation you won’t want to miss! Live music for folk dancing by SIX hot local bands specializing in traditional and contemporary music from Eastern Europe. Many of the dances are easy enough to learn on the spot. Everyone’s invited to dance, but no one is required to; the Avalon has plenty of room to sit and watch. In Eastern Europe, live music and dancing are always accompanied by food! So roll up your sleeves, make a great potluck dish and come celebrate! The dance music program will feature tunes from Albania, Bosnia, Bulgaria, Croatia, Greece, Hungary, Macedonia, Russia, Serbia, Turkey, and Roma (Gypsy) traditions. While the majority of dances will be line dances, a few waltzes and other couple dances will also be included. See ensemble line-up below. Many of the ensemble members have been performing Eastern European folk dance music for the past several decades, at concerts, festivals, benefits, and in collaboration with each other, for the enjoyment of dancers and listeners all over Colorado and the region. Look for more information about the performers below! Join us in celebrating Eastern European traditions of live music, dancing, and food at the Avalon Ballroom, on Saturday, November 11, 2017. Don’t know what to bring or don’t like to cook? Please contact Mary Ann, the food coordinator, at maesaussotte@comcast.net for assistance/ideas, etc. In conjunction with the Denver conference of the Society for Ethnomusicology, Planina will perform at the Mercury Cafe on Wed., Oct. 25, 7:30-10:30pm. The Mercury Cafe serves local, organic food, so come early, have dinner downstairs, and then come upstairs for great listening (and some dancing). 7:30-8:45pm: Planina - Songs of Eastern Europe. Planina explores the penetrating harmonies, asymmetric rhythms, and gorgeous melodies of traditional music from the Balkans and Russia. 9:00-10:15pm: Sherefe. Sherefe are the region’s most well-loved ambassadors of music from the Eastern Mediterranean specializing in music from Turkey, Greece, and beyond. Planina appears on KGNU Kabaret 88.5FM. Tuesday, October 17, 7:30-8:00pm. Friday, Sept. 15, 5:30-7:00 p.m. Thanks to a grant from the CU President's Fund for the Humanities, Planina will be presenting a creative artistic seminar, Voices: Dimensions of Cultural Diversity and Critical Dialogue, that combines refreshments and an hour-long concert with dialogue with students in their first year at CU. The discussion will address some of the cultural and social human heritage that our songs represent, such as the stages of life, encounters with trauma, and reveling in nature and the human experience. The presenters have generously allowed Planina to make this presentation available to the public at no charge as well as to the students. If you plan to attend, please send a “yes” RSVP no later than 5:00pm on Tuesday, 9/12, to grap@colorado.edu, with the subject line: Attending the Planina Performance on Sept 15th. Be sure to let them know how many people are coming. The program is sponsored by CU's Global Studies Residential Academic Program and funded by the CU President’s Fund for the Humanities. Folks dancing during Planina's set at the 2016 Boulder International Festival. “In front of my window, a lilac bloomed. In my sore heart, love was awakened,” begin the lyrics of a Russian Cossack song about love lost. In this concert, Planina explores the panoply of love’s flavors, from a father’s love for his baby daughter (Hungarian Rom) to a soldier’s love for his horse (Russia); from a girl asking the stars about her lover (Bosnia) to the awkwardness between a girl and boy expected to spend the night together platonically (Republic of Georgia). Songs on other topics—planting grapes, building towers, heroes—punctuate the evening, as the audience is treated to musical styles from the Balkans, Russia and beyond. Some of the songs are performed a cappella and others are accompanied by folk instruments and/or modern instruments, including accordion played by guest artist Petar Teodosijev. The Congregation Nevei Kodesh sanctuary, with its warm acoustics, makes it particularly suited for Planina’s nuanced, multi-layered choral arrangements that aren’t right for outside festival appearances but whose harmonies can pierce right through to the heart. This is Planina’s first full concert in Boulder in more than a year. Don’t miss it! Purchase Advance Tickets Now, No Surcharge! The festival is produced by CU's Slavic Languages Department--a department where TWO Planina members currently work. This family event is free and open to the public. Participate in traditional Russian games, eat traditional Russian foods prepared by the students, see traditional effigy dolls and costumes, and enjoy Russian, Ukrainian, Georgian, Polish and Balkan songs live with Planina. Rain or shine! In case of wet weather Planina will perform on the patio of the west side of the McKenna building. The City of Edgewater is hosting a series of Thursday night events combining farmer's market and music. On Thurs., Aug. 11, Planina will sing and play, including songs for listening and for folk dancing. Please bring folding chairs! There's no official dance floor, and very limited space, but there's a little room for dancing in the street. It's on Edgewater's Historic West 25th Avenue between Sheridan Boulevard and Ames Street. Click here for directions and updates.